You writers are way tooooo hard on yourselves. I hope that you often find things in your work that you like and perhaps if you insist on self-flagellation you will keep the other hand free to pat yourselves on the back. Have a great one, EC. I don't write any more, but sometimes when I did, I would read something I had written previously and thought, "Dang, that's good, did I write that?" I've been told on more than one occasion (art wise, not writing) that I was too hard on myself. Now I will tell you the same thing. 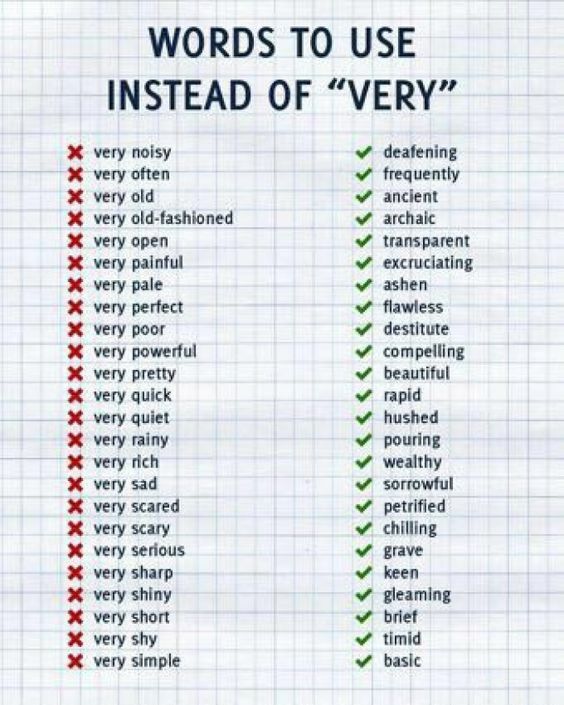 I was super impressed with that "very" word list. I must remember that one, because there are lots of words I should be using other than my favorite, which is "awesome." Like Sharon, it happened to me to read spmething I wrote days/weeks before and be pleased and amazed with my " muses's inspiration". 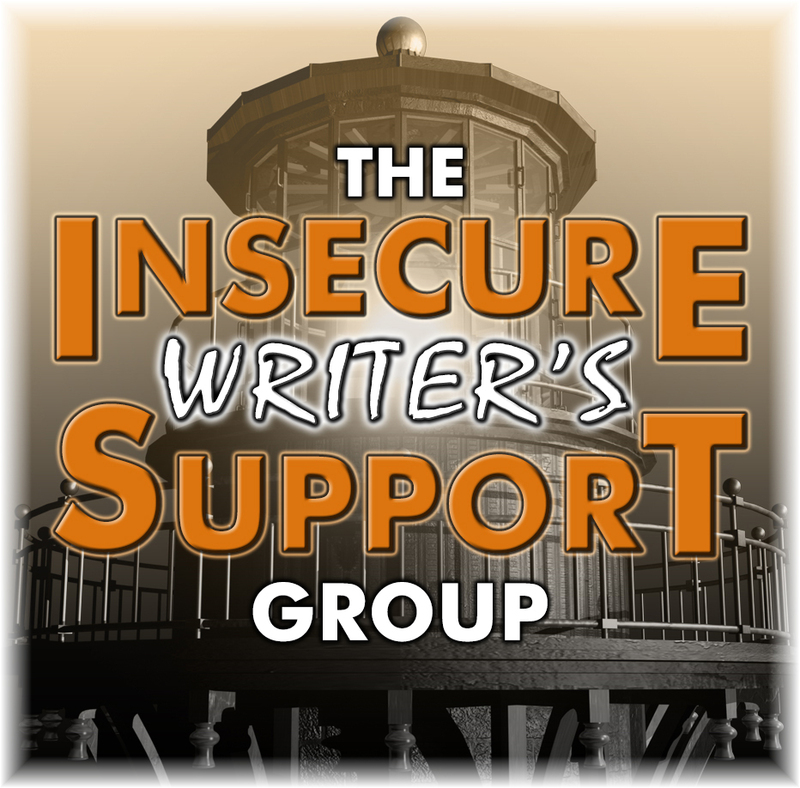 Most writing guides advice us to avoid useless wording, very being one of the culprits. And you have a lovely one too, Carmen. I haven't really thought about those words and I am not sure what I use when writing blog posts, but I will keep in mind about the word 'very'. YOU, have a marvelous day. That's a great list of alternatives. Sometimes it does feel like we're going backwards, doesn't it? 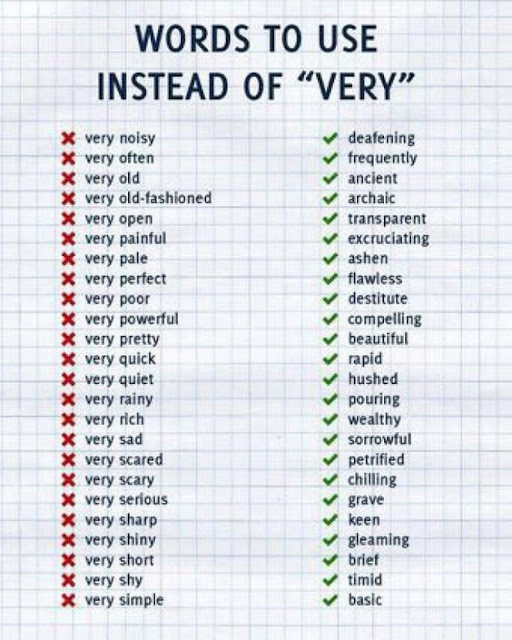 I now want to go through my story to see how many times I used "very." Most of these terms I would not have thought of. I agree, Jamie. There are several words that I wouldn't have thought of that are perfect: clean, descriptive. I love the alternatives and have to remember to use this for the future since I use Very a lot. Whoever made the list did come up with some great alternatives, didn't they, Birgit? It sometimes does indeed, Pat. I cannot understand these difficulties because I am not a writer. All I know is what I read before my eyes and you writers make it seem so effortlessly! Right back at ya. Your haikus are seamless. I have Grammarly but I rarely use it. I have to watch repeats too, Hilary. It's so easy to do. Thanks for posting the word list about very. Love it. When I'm editing is using when I come up with ideas. I hardly ever come with ideas when I'm writing the piece or the manuscript. I can relate, Pat. I sometimes feel like my first draft is an intensified outline. I'm sure the writers here will find that list helpful. Well, I guess you can turn that around and think you can still come up with good stuff when things aren't going so well. Love the substitute word list. Very helpful... er, I mean... indispensable! I like your positive attitude, Nick. Thanks for the word list that could be helpful! 'Could be helpful':) Good save, True. I have the Grammarly plug-in that works well when I'm writing something online. But I usually forget to copy and paste my text in after I've written something in Word! The newer version of Word has really great grammar correction--although it does NOT like terms like "in order to!" I also learned "of" isn't necessary in "all of" most of the time. I often edit my work and find little tidbits/sentences that make me blink and say, "Hmm. I am good." That's always a great moment. I love those moments when I read something I wrote and am impressed. And yeah, always seems to happen by accident, not when I'm stressed while actually "thinking" on what I'm writing. We seem to shut ourselves down when we overthink don't we, Dolorah? Greetings! I like your "very" list. It's...um, er, well I can't say "very smart" now, can I? O.k. So it's cool. Yeah, it's cool, 'cause, like, I know cool things when I see 'em. Yeah. Glad you liked it, Tyrean. Thanks for stopping by. We are too hard on ourselves! 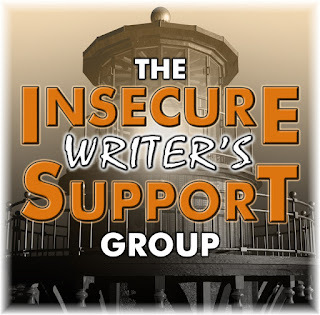 As you know, I don't write, but I appreciate all who do! Great list!